My dad’s birthday was July 3. He would have been 75 years old this year. Still ingrained in my mind — even after all these years of him being gone — July 4th weekend was always synonymous with some kind of birthday cake. Something celebratory, both for America’s birthday and his. That said, even the most ambitious of us tend to look for simpler summer desserts this time of year. The weather is hot, we are lazy, and we pretty much want to enjoy all the feelings of freedom that gaining independence should conjure. (I wonder if the signers of the Declaration would have had second thoughts if their wives or maids threatened kitchen revolts!). 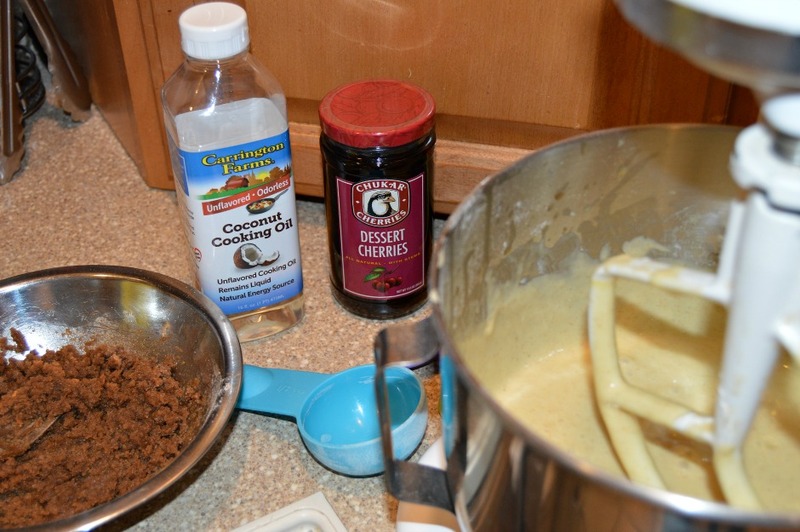 I also tried the recipe using Carrington Farms Unflavored Coconut Cooking Oil – more buttery than just using oil, but a nice non-dairy pareve alternative for kosher baking, especially in the cake’s topping. I’ve used other coconut oils before but this one had no strong coconut odor and keeps in a liquid state (easier for proper measuring!). It came together quickly and easily…and I’m sure my Dad would have had a second piece. Enjoy it with your families this Fourth and enjoy the freedoms we so often take for granted in our great country. Mix together brown sugar, flour and cinnamon in a small bowl. Using your fingertips, break up butter or mix in coconut oil into flour mixture until coarse crumbs form. Set aside. Preheat oven to 350 degrees. 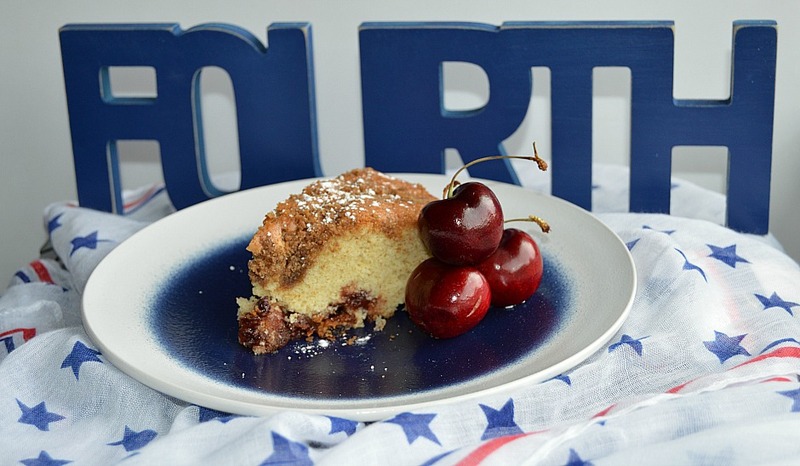 Grease a 9 x 13 cake pan. If using fresh or jarred cherries, toss with ¼-1/3 cup sugar in a mixing bowl. Set aside. In a separate large mixing bowl, use electric mixer or stand mixer fitted with paddle attachment to cream butter/coconut oil and sugar together. Add eggs and beat until well blended. Add remaining ingredients to the mixture, alternating between wet and dry ingredients until everything is well mixed. Scrape down sides of the bowl and beat for another minute to blend. Spread half of the batter evenly onto the bottom of the prepared cake pan. Drain cherries and scatter them as an even layer over the batter or spread pie filling evenly. Evenly spread remaining batter over the cherries or filling, and sprinkle topping over the batter. Bake for about 50-60 minutes or until toothpick comes out clean. Let cool, cut into squares and enjoy! If you happen to be doing your own cooking or baking with cherries this season, below is a list of cherry equivalents to help you on your way.